Garage premises on South End, vacant as of April 2017. Still vacant as of October 2017. 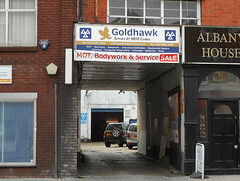 It was previously occupied by a car servicing and repairs business called Goldhawk Service & MOT Centre, but this closed down in 2016 or early 2017. Last edited 2019-02-07 14:58:10 (version 30; diff). List all versions. Page last edited 2019-02-07 14:58:10 (version 30).